When looking for fast-growing trees to create a privacy hedge, choose a variety of evergreen. Evergreens provide year-round protection that deciduous trees and shrubs don't offer. 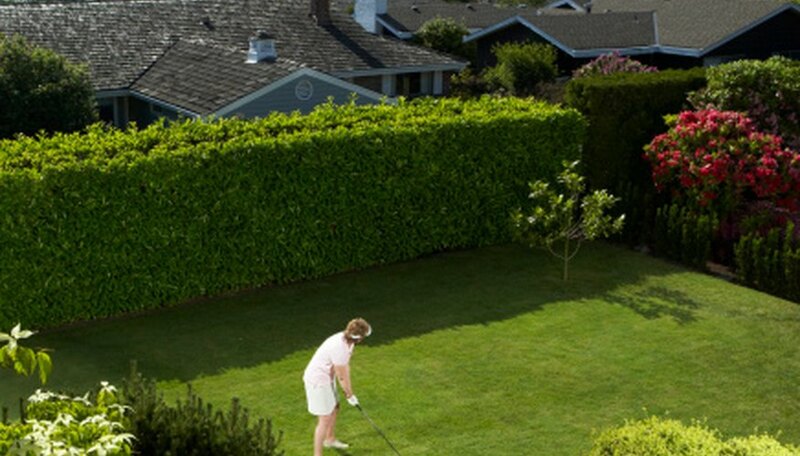 One drawback to using fast-growing trees and shrubs is that they don't live as long as their slower-growing brethren. Use these as a temporary measure as you wait for your slower-growing hedge to mature. Both the Nellie R. Stevens holly (Ilex x 'Nellie R. Stevens') and the Foster's No. 2 holly (Ilex x attenuata 'Fosteri') create a 12-foot hedge within 5 years, if you start with a 3-gallon plant. They are tolerant of a wide range of soil types, including heavy clay soils in areas of sun to partial shade. Nellie R. Stevens holly can grow 30 to 40 feet tall with a 15 foot width. Foster's No. 2 holly grows only 20 to 30 feet tall with a 10 foot width. Space them about 4 to 6 feet apart. Both are hardy in U.S. Department of Agriculture Plant Hardiness Zones 6 through 9. The Eastern white pine (Pinus strobus) is one of the fastest-growing pines. It reaches a height of 10 to 15 feet within 5 years. At maturity, it reaches a height of 50 to 80 feet with a 20- to 40-foot spread. It grows in sun or light shade, as long as the soil is fertile, moist and well draining. Plant each tree 5 to 7 feet apart to create a hedge. It is not tolerant of air pollution or strong winds. It is listed as hardy in USDA zones 3 through 8, but dieback due to stress has been reported in zones 7b and 8. The Western red cedar (Thuja plicata) is also known as the giant arborvitae. It grows at least 10 to 15 feet tall within 5 years and can eventually reach a height of 50 to 80 feet with a 15-foot spread. When used as a hedge, plant each tree about 5 to 7 feet apart. It prefers moist, well-drained soil in full sun or partial shade. Avoid planting it hot, dry areas. It is hardy in USDA zones 5 through 8. The Leyland cypress (X Cupressocyparis leylandii) grows about 2 to 3 feet each year. It eventually reaches a height of 60 to 70 feet with a 15- to 25-foot spread. It tolerates salt but is only mildly drought resistant. It tolerates almost any type of soil, as long as it is in full sun. It is hardy in USDA zones 6 through 10. When using it as a shrub, plant each tree about 5 to 7 feet apart. The North privet (Ligustrum x ibolium) is a deciduous shrub growing up to three feet each year. It reaches a height of about 8 to 12 feet with a 4- to 6-foot spread. It tolerates a wide variety of soils in full sun. It is hardy in USDA zones 4 through 8. When planting, space each specimen about 2 feet apart. University of Tennessee Agriculture Extension Service; Evergreen Trees for Screens and Hedges in the Landscape; Wayne K. Clatterbuck, et al.